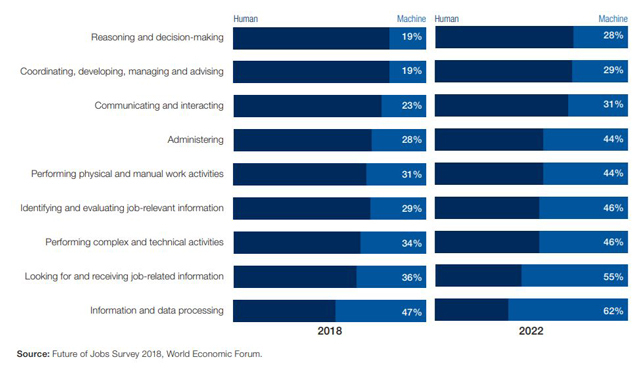 A comparison of human-machine working hours for 2018 and 2022. Source: Future of Jobs Survey 2018, World Economic Forum. Will we humans lose more jobs than we gain when machines take over the world of work, or will it be just the opposite? The experts are still trying to figure that out. In December 2017, a report from management consulting firm McKinsey & Company, "Jobs Lost, Jobs Gained: Workforce Transitions in a Time of Automation," predicted that between "almost zero" and a third of work activities could be displaced by 2030, with wide variation among countries. (The more advanced the economy, the more likely the impact of automation.) While workforce transitions could hit between 75 million and 375 million people, overall, McKinsey found, more occupations will change than will be lost in a machine-driven world. Yet recently, the Bank of England's top economist predicted to the BBC that artificial intelligence and the use of machines would require a massive "skills revolution" to avoid "a widespread 'hollowing out' of the jobs market, rising inequality, social tension and many people struggling to make a living." Now, a new viewpoint on the topic has been published by the World Economic Forum, the nonprofit that draws world leaders in politics, business and culture to Davos, Switzerland, each year. "The Future of Jobs Report 2018" examines the possible outcome for the "Fourth Industrial Revolution," the name given to the movement that describes work traditionally done by humans being handled by "machines and algorithms." The bottom line offered by the latest report: a "net positive outlook for jobs." While about half of today's jobs will remain "stable" up to 2022, the rest will need to undergo adaptation through reskilling and upskilling. This is the second time the Forum has tackled the subject of jobs. Two years ago, it issued its first report on the topic. The latest edition covers the 2018-2022 period. Researchers surveyed human resources leaders in the world's largest employers, representing some 15 million workers and 12 industry segments, to understand their decisions regarding planning, hiring, training and investment. As a backdrop to the technology underpinnings, the report identified "positive" drivers affecting the world of work and "negative" drivers. Among the positive: ubiquitous high-speed mobile internet, artificial intelligence, broad adoption of big data analytics and cloud technology. Among the negative ones: increased protectionism, increased cyber threats, shifts in government policy, the effects of climate change and societies that are increasingly aging. Across all industries, by 2022, the Forum wrote, growth in "emerging professions" is expected to increase their share of employment from 16 percent to 27 percent among the total employee base of company respondents. Simultaneously, employment share of declining roles is set to decrease from its current 31 percent to 21 percent. E-commerce and social media specialists. Importantly, the "vast majority" of people surveyed for the report anticipate that by 2022 the skills needed for most jobs "will have shifted significantly." That's quantified. Average skills stability — the proportion of core skills required to perform a job that will remain the same — is expected to be about 58 percent, which means that workforce skills will see an average shift of 42 percent between now and 2022. The result will be a "reskilling imperative," demanding skills training in multiple areas in technology as well as soft skills, such as creativity, originality and initiative, critical thinking, persuasion and negotiation, attention to detail, resilience, flexibility and complex problem-solving. Three areas that will see an "outsized increase in demand relative to their current prominence" are emotional intelligence, leadership and social influence, and service orientation. Although the respondents in the survey expected their companies to invest in filling the skills gaps among their workforce with on-the-job training, formal education providers get a nod too. According to the report, alongside policymakers and regulators, educators "will need to play a fundamental role in helping those who are displaced repurpose their skills or retrain to acquire new skills and to invest heavily in the development of new agile learners in future workforces by tackling improvements to education and training systems." The report on the future of jobs is openly available on the World Economic Forum website.